The Main House alone may be rented during the shoulder seasons (contact owner thru HomeAway). It is at the water's edge with 180 degree vistas of water & islands from large windows & side deck (has 2 other decks as well). Privacy, sunny exposure (southeast). One floor living with 2 bedrooms, 1 bath w/ tub and shower, large modern kitchen, living room, dining area, sun room, and laundry facilities. The Guest Cottage is set back from the water with water views from all rooms and 2 decks. Two floor living with 1 bedroom, 1 bath w/ shower, kitchen, living room with cathedral ceiling & dining area. Outdoor BBQ & picnic area, hammock in sheltered apple grove w/ water view, outdoor & indoor showers. This is a deep water property with moorings available for use along with a skiff to row between the moorings and the dock. Both houses are rented together during the summer season. This is a non-smoking property. The property is located within walking distance of the new and highly acclaimed Dolphin Marina Restaurant. Also charter boat service to nearby Eagle Island. With 180 degree views of Potts Harbor, it is easy to watch the lobster boats come and go and watch the tides change. This is our third visit at Larry Holden's family cottage and we found it very comfortable indeed. Since our first visit he continues to do repairs and updates to make the stay enjoyable. Thanks Larry for making your unique property available to those from away and allowing us to feel like we belong there. 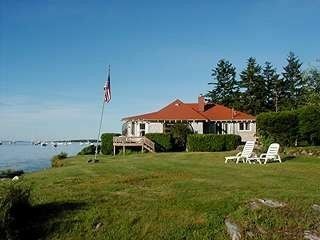 The property was on a lovely spot, with views of open ocean, inlets and bays, both working lobster boats, the daily schooner "Alert" cruise, and private pleasure boats. Multiple places to sit and relax, both inside and out, on the deck or on the lawn, even a hammock. Very comfortable rooms and bed. Nice, roomy shower with good water supply. Roomy cook's kitchen with a large fridge. Plenty of storage for groceries. Outdoor shower, also with ocean views. The actual house was well off the only small and quiet road. The location was convenient to the bustling downtown of Brunswick, with Gelato Fiasco, a Hannaford's supermarket. and Wild Oats Bakery and Cafe, which also has frozen, prepared meals if you want a break from cooking. Nearby were several excellent restaurants, both takeout and dine in. The Winnegance Restaurant and Bakery, a treasure, is about 35 minutes drive just outside of downtown Bath. Nearby is the beautiful Maine Maritime Museum, and Bath Iron Works, manufacturing Naval war ships. And about 20 minutes down Route 209 is spectacular Popham Beach State Park. Farther still is Spinney's Restaurant for dining next to the mighty Kennebec River. We have been going to Maine for about 20 years now. Larry's is the best of all the places we have stayed. Hope to stay here many more times. Could not ask for a better location to relax and take in a true New England Seacoast. Active Lobstering Harbor. Not far to Brunswick for shopping needs. Had 2 grandchildren with us. They had plenty of outside space. Highly recommend! 20 minutes from Bowdoin College & Brunswick; 40 minutes to Freeport. Please note that just one cottage, rather than two, may be rented per week. Contact the owner regarding the rental price for just one cottage for the week in question.